Contemporary cities grow in space and time, every day struggling competitively against others, crossing spatial and conceptual limits: in the context of a refashioned globalism, widely (if partially) expressed via the ideological discourses of “globalisation”, we are also seeing a broad redefinition of the urban scale (Smith 2002, pp. 423-430). On the other hand, during the last part of the 20th century, new techniques and new organisation of production, combined with new individual and collective behaviours, lead to a number of vacant spaces appearing in the post-industrial borders of cities. Brownfield land substitute the 20th century’s area of expansion; the city starts shrinking to its limits. These limits change their role: no longer just a dividing line, they become a spatial area belonging to various regions at the same time, shaped by local meanings from different sources (Zanini 2000). Limits are thresholds: they aren’t part of the city’s core, but neither of its outskirts; liminal spaces (Turner 1982) are surrounded by the dissolving boundaries of the late 20th century’s expansion and contraction. Here, liminality depicts a “no man’s-land” open to everyone (Zukin 1991, p. 269). These transitional spaces are in need of renovation. Their strength lays in their peculiarities: forgotten by the city, by its administration and urban policies, abandoned to a development of their own. They are independent from the common process of city growth, consisting of high- density development and the rising of land value. Therefore, limits can be aimed at innovative processes, focusing on vacant land regeneration, rather than on major expansion. London has changed in shape and size in the past century: its unstoppable growth has affected its surroundings, gradually including outer lands in different ways in its western and eastern limits. In particular, the eastern areas of London have witnessed a new concentration of docks and industrial activities. This is due to a lot of factors, such as proximity to the Thames Estuary, the abundance of flat lands, a complex network of waterways, etc. The eastern boundaries became the working machine of the entire city. The industrial pattern expanded, compressing all the empty spaces of the city’s eastern fringe, cutting the continuous urban landscape with a hard, infrastructural border, railways and highways, and causing social exclusion and economical gaps, in comparison to higher standards of living in the city’s inner parts. This phenomenon increased in recent times with the closure of many factories, the relocation of docks and the consequent loss of jobs and land value, in addition to the economic and social crisis. As in the rest of Europe, after deindustrialisation, urban growth came to a standstill: the city shrunk to its limits, uncovering its drosscapes, deeply saturated by official and unofficial uses, waiting for a transformation to happen, open to various opportunities (Berger 2006), (fig. 1). These vacated and deprived lands stood as a claim for the contemporary city. For ages, urban policies forgot to address liminal spaces. Contemporary age needs to rethink the remains of the industrial era, its physical and social decay, as well as a global, critical analysis of shrinkage effects above vast areas (Oswalt 2006). The analysis brings the rule and importance of liminal spaces within the contemporary city to wider recognition: shrinkage is uncovering, there is a deep process of interpretation of spaces of transition, rapidly evolving into spaces of opportunity. The regeneration of these spaces of transition initially starts as a spontaneous process, led by groups of artists and creative people, advancing in a space open to everyone, where usual relationships between things are suspended (Ley 1996): rent is lower than usual; there are many empty spaces; the remains of the industrial age provide aesthetical inspiration; there is a certain wish for isolation, useful for a creative environment. As Cameron and Coaffee (Cameron, Coaffee 2005) point out, this process of creative appropriation of places is the first wave (Smith 2002) of a double-faced regeneration: on the one hand, it succeeds to enhance existing values, by building on the post-industrial, liminal appeal. On the other hand, as pioneers of regeneration, artists produce a dislocation (gentrification) of existing values (and people), pushed away by further waves of gentrifiers, members of the middle class attracted by the creative environment produced by culture-led regeneration (Evans, Shaw 2004). Consequently, there is always the risk of repeating old urban regeneration schemes: the establishment of a creative environment brings economic and social change in land value and meanings, thus leading to a generalised absorption of liminal areas into the city. This search for new spaces of transition, easter than east, produces an expansion towards outer lands: moving limits again. This process of moving limits has happened in the last couple of decades in East London. The urban rebirth of the East End started from vacant lands, remains of the industrial age, spaces of opportunities where everyone was welcome. Here, groups of young, creative people started to enliven places by adding a mixture of social functions, economic vitality, and promotion of culture. Artists as pioneers of spatial and social regeneration spotted deep meanings in unvalued spaces. This phenomenon eventually led to the inclusion of the outskirts in the inner city, showing their peculiar potential as flexible parts of the contemporary city. During the 80’s, this happened in areas like Hoxton and Shoreditch, nowadays a vibrant leisure district. 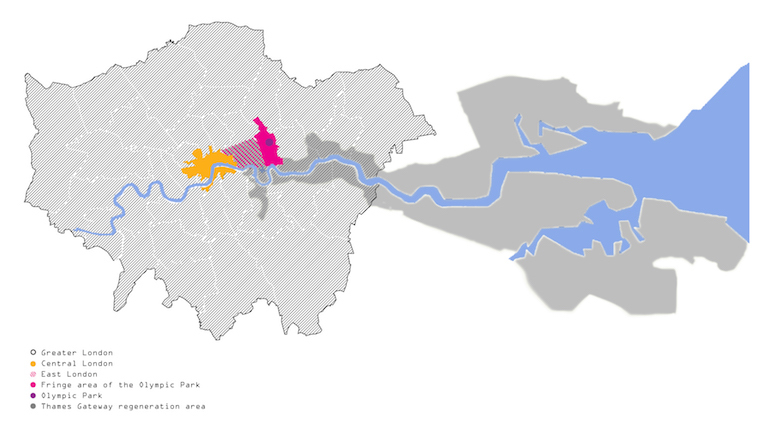 As a consequence, property prices have been rising since the beginning of the 21st century, forcing people to move to cheaper areas nearby (London Fields or Bethnal Green, eventually up to the fringe area of the Olympic Park), in search of new spaces of opportunities, consequently “uncovering” eastern limits. The idea that progress can go on uniformly and metropolitan life can expand everywhere implies an infinite growth of needs, as well as an unsustainable ecological footprint (Latouche 2012). Consequently, in the future, our main preoccupations will be energy, land consumption and demography. A key aspect will be the renewal of the post-war 20th century landscape. This also involves renovating entire neighbourhoods, and building sustainable and energy-efficient complexes. The point is not to reduce urban growth, but to reinterpret urban culture and lifestyles, implying the necessity to even reconsider parts of the city which gradually lost their meaning and shape. 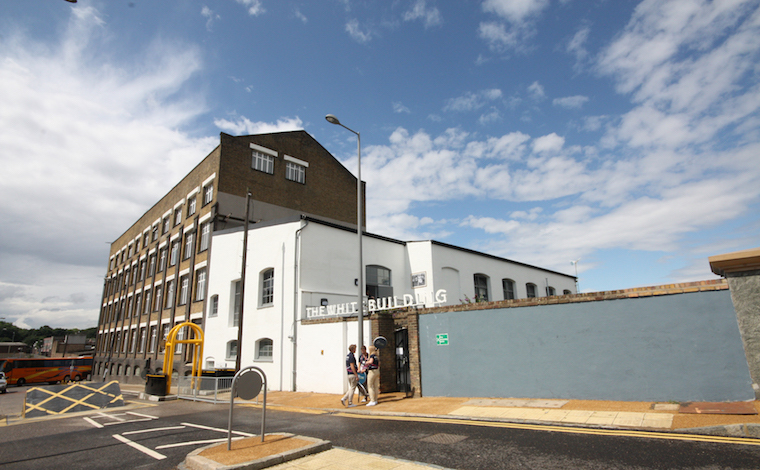 In the last 10 years in London, a particular interest grew around the development of ways to accommodate city growth within the existing boundaries, especially in the remains of the deindustrialisation era. This was firstly, done by public agencies (Architecture and Urbanism Unit, London Borough Councils, LDA, TFL), private developers and landowners, to mark a change in the capital’s history; the end of decades of population decline, and a new expected increase in population. The central focus was on East London, because of its peculiar potential to absorb a significant quantity of growth on previously developed land (DFL, Three Projects, 2010). 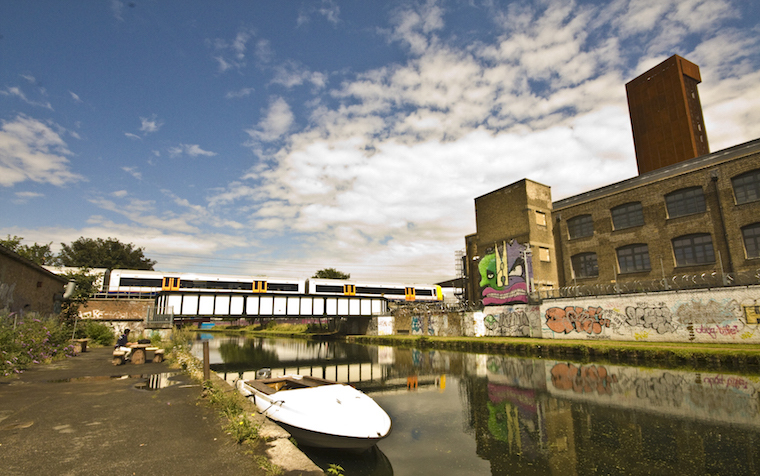 The 2012 Summer Olympics acted as a detonator for the transitional space of the East End to become a new place, seizing the opportunity for urban regeneration. Additionally, according to the Olympic Games’ official documents, East London was interpreted as the fringe area of the Olympic Park. Consequently, the project expanded itself, not only including the specific site of the Olympic Park, but also the fringe area in general, marking the necessity to rethink a wider relationship between liminal areas and inner city areas. This interpretation comes from the Thames Gateway Project (2004), a prior approach to regeneration which was both a redevelopment region and an urban growth destination (fig. 2). Consequently, the Olympics approach had its value in the proposition of some fundamental design principles. The project made a delimitation, demarcating a specific area for regeneration. It was connected to higher levels of spatial planning, thus guaranteeing implementation and continuity with a wider vision of change and redevelopment. It synthesised all these concepts in a real project, the legacy master plan, to visualise and orient future development. The planned legacy master plan pursued a city model which integrated part of the previous values and a good part of new additions: housing complexes, “honouring” English tradition, but dislocating previous inhabitants (Raco, Tunney 2010); shopping centres and restaurants, following the model of the consumption city, as in other major planned urban interventions (Liverpool, Dublin, Glasgow). Even though cultural activities and general creativity received general support during the regeneration process, there has been a reinforcement of a model of neighbourhood “for the middle class”. In other words, the eastward dislocation phenomenon has been in some ways supported by Olympics-related policies, (fig. 3). Transforming liminal areas into models of inner places increased their economic and social value. But closer interrelation between local uses and new actions was needed in order to protect fringes of transition from an indiscriminate absorption into the consumption city. Consequently, the challenge is to accommodate the growing population by carefully increasing densities within the city limits, instead of expanding the urban territory. The aim is to develop a strategy for growth by regeneration, by uncovering new meaning in existing, abandoned spaces. In this perspective, the Olympic Park was a gigantic regeneration effort; the near future will tell if this effort has been rewarded. However, after about ten years of urban, social and physical regeneration, the most patent result has been the transformation of this outer area into a new, more efficient and competitive one. We shall see if the price to pay is the loss of its unique liminality. In any case, in a city of 12 million people, no area is expected to always stay as it is; that’s why the rush to cross limits, both conceptual and material, will never truly stop–and the effort to control it will be one of the most appealing challenges for future planning. — Berger A. (2006), Drosscape, Wasting land in urban America, Princeton Architectural Press, New York. — Cameron S., Coaffee J. (2005), ‘Art, Gentrification and Regeneration, From Artist as Pioneer to Public Arts’, in European Journal of Housing Policy, vol. 5, n. 1, pp. 39-58. — Evans G., Shaw P. (2004), The contribution of culture to regeneration in the UK, A review of evidence, Report per il DCMS, Department for Culture Media and Sport, London. — Imrie R., Lees L., Raco M. (eds., 2009), Regenerating London, Governance, sustainability and community in a global city, London, New York, Routledge. — Jacobs J. (1961), The death and life of great American cities, Random House, New York. — Lancerini E. (2005), ‘Territori lenti: contributi per una nuova geografia dei paesaggi abitati italiani’, in Territorio, n. 34, pp. 9-15. — Latouche S. (2012), Vers une société d’abondance frugale, Contresens et controverses sur la décroissance, Ed. Mille et une nuits, Les Petits Libres, Paris. — Ley D. (1996), The New Middle Classes and the Remaking of the Central City, Oxford University Press, Oxford. — Oswalt P. (2006), Shrinking Cities, International Research, Vol. 1, Hatje Cantz Verlag, Ostfildern-Ruit, Germania. — Raco M., Tunney E., ‘Visibilities and Invisibilities in Urban Development, Small Business Communities and the London Olympics 2012’, in Urban Studies, vol. 47, n. 10, 2010, pp. 2069–2091. — Secchi B. (2005), La città del ventesimo secolo, Universale Laterza, Roma. — Smith N. (2002), ‘New globalism, new urbanism, Gentrification as global urban strategy’, in Antipode, vol. 34, n. 3, pp. 427–450. — Turner V. (1982), From Ritual to Theatre, The Human Seriousness of Play, PAJ — Publications, New York. — Zanini P. (2000), Significati del confine, Bruno Mondadori, Milano. — Zukin S. (1991), Landscapes of power, From Detroit to Disney world, University of California Press, Berkeley (US). An earlier version of this article was presented in Urban Transcripts 2012 “London the (n)ever-changing city”, exhibition and conference, in London, UK, December 2012. Anna Attademo, Architect and Urban Planner, is currently a post-doc researcher at the Department of Architecture of Naples, with a fellowship for two European funded projects about peri-urban regeneration process. In 2012, she submitted a PhD thesis about 2012 London Olympics regeneration project. Anna participated in international conferences and seminar as author of papers on the themes of urban fringes analysis and regeneration.